THE CORONATION HALL has recently had a major renovation adding an extra room, known as the Jubilee Suite. It is set right on the water’s edge in the heart of the village of Dale, next to the, The Griffin which specialises in locally caught seafood. The Boathouse Cafe, open from Easter to October, is also very close. VIEW FROM THE HALL. Given that Dale is a beautiful seaside village within the Pembrokeshire Coast National Park and directly on the coastal path, the Coronation Hall is a superb venue for many different activities – training, team building, exhibitions, courses, presentations, shows, weddings and parties. It is just a few metres from the seafront. Dale is renowned for its sunny climate and this is most noticeable in autumn, winter and spring when we enjoy bright days while elsewhere it is gloomy and damp. At these times Dale is a quiet place with ample free parking. From October to April we have plenty of availability for bookings but the Hall becomes very busy at weekends from mid May to mid September. The Hall has excellent wheelchair access and facilities, with a drop-off point at the front of the Hall – the village car park is approximately 100 metres from the Hall. Two rooms are available for hire either together or separately. The Kitchen can be accessed from either room. THE MAIN HALL seats up to 120. It has a stage with a theatrical lighting system (owned by DADS) and a lift for disabled performers. It is also equipped with a drop down screen, an HD projector and a modern sound system. This Hall is suitable for training small or large groups, workshops, exhibitions, lectures and presentations or film shows. 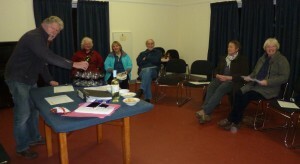 The Hall has all the necessary licences for public entertainment and for showing films to private audiences. 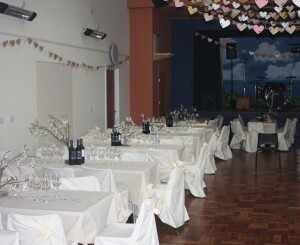 The Main Hall can seat 100 for formal occasions, such as weddings, still leaving room for a bar, a band and a dance floor! THE JUBILEE SUITE is suitable for smaller meetings and other varied functions. Or it can be used in conjunction with the Main Hall for group work during larger training events. THE MODERN KITCHEN is well equipped with range cooker, fridge, microwave, double sink and electric urn. Additionally there is plain white crockery and modern cutlery to serve 150. 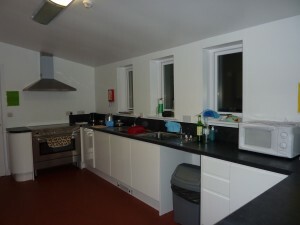 The kitchen has recently been inspected by the County Council, achieving the highest score – 5. 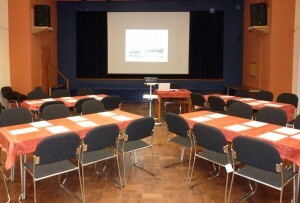 The Coronation Hall is an ideal venue for a team building event. West Wales Wind Surf & Sailing – WATER SPORTS provider is right next door. West Wales Activity Group is also based there. For further information contact Sam www.dalesailing.co.uk. Tony and Kath at the Boathouse Café on 01646 6364989 or Gina at Trehill Farm – www.trehillfarm.co.uk, . * A TEN must be applied for by hirer if selling alcohol. The address of the Hall is Coronation Hall, Dale, Haverfordwest, SA62 3RB. If you are interested in booking the Hall please contact the Bookings Secretary, Wendy Kehoe on 01646 636721 or wendykehoe@yahoo.co.uk. Before a booking is accepted the Bookings Secretary must have received a completed Booking Form which can be downloaded here. All hirers of the Hall must read and note the Hall’s Conditions of Hire, Equal Opportunities and Safeguarding Policies and if selling alcohol the Age Verification Policy which can be download here as can a leaflet for hirers giving useful information about all the practicalities involved in hiring the Hall.